Snow Loads on Roofs | Coastal Engineering Co. When does the amount of snow that has settled on a roof become hazardous to its structural integrity and performance? Sooner than you may think. Ongoing winter storms characterized by high winds and heavy snow fall result in irregular snow accumulations across buildings and landscapes. Structural problems arise for homes and businesses when snow settles on a relatively small portion of roof that is not equipped to handle the additional weight load. On Cape Cod, the Building Code required a minimum uniform design load for snow of 25 pounds per square foot (though it can be more depending on the town and type of building) for roof designs, which is equivalent to 15 inches or more of snow fall. Our windy storm patterns bring snow drifts that can easily pile up several times that amount, resulting in a tremendous overload on the roof. Unbalanced snow loads — whether the result of wind drifts, uneven melting effects from the sun, or uneven snowfall based on variable protection (usually from trees) — aren't necessarily more likely to cause a roof collapse, but they do stress a roof and its connections in places that balanced loads do not. Nevertheless, if rafters, valleys, ridges, and hips are properly sized for the balanced snow condition, and if connections between members, at ridges, and at the attic or ceiling are sound, most residential roofs should be able to handle both balanced and unbalanced snow loads. There are of course special cases — like deep drift loads on large flat roofs; and sliding loads, where snow slipping off a higher roof inundates a lower one — that should be looked at carefully by a structural designer. The building codes don't attempt to account for all possible snow load scenarios. Instead they reference ASCE-7, a specification published by the American Society of Civil Engineers and the Structural Engineering Institute called "Minimum Design Loads for Buildings and Other Structures"; it includes formulas for calculating snow design loads for various locations and roof configurations. Generally, loads get higher where more snow falls, when roofs are shallower rather than steeper, and where drift loads can accumulate. 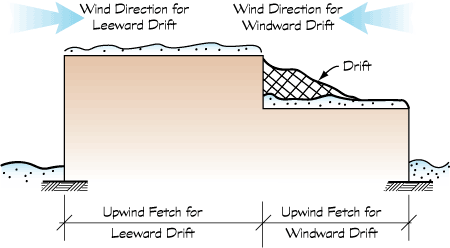 In geographical areas vulnerable to severe winter storms, structural design engineers should take snow drift conditions into consideration in the original design and construction of the building by specifying heavier joist members or decreasing the spacing of typical joist members in the high snow load influence area to address this situation. Older buildings, built before the advent of modern codes (Massachusetts has enacted the first Building Code in 1975), are at a higher risk to snow drift accumulations. Some newer buildings with additions are also vulnerable because the addition may have a roof structure at a different pitch than the original structure. This can create an ideal situation for blowing snow to slide and settle on the lower roof and create an overload. Homeowners and business owners can take steps to reduce the likelihood of a roof structure being compromised due to snow overload conditions. All roofs are not created equal; short of a full review of the existing building plans and a comprehensive evaluation of the existing roof structure, it is difficult to determine whether a roof may fail when faced with a snow overload condition. Proper roof design, structural maintenance, and inspection after a storm can bring peace of mind during the long winter months. Contact us for more information regarding our engineering design for residential and commercial structures, our building technology capabilities, and our construction oversight services.